A longstanding VPN trying to keep pace with the market leaders. There have been a few changes over the past twelve months, but there is still room for improvement in some crucial areas. A massive 12 concurrent connections. A big selection of user-friendly apps. Solid no user logs policy. StrongVPN is one of the oldest VPNs around, but one which has made a number of changes over the past couple of years. In our new review, we take a closer look to see how they compare to the market-leaders. These prices have not changed since last year and are pretty average in the industry. The monthly price is pretty high, but the annual price is competitive without being the cheapest around. There is a 30-day money-back guarantee available with both packages, so you do have plenty of time to try StrongVPN before you have to commit any money. Payment can be made by the usual credit cards, including American Express. There is also a PayPal payment option and, more worryingly, an Alipay one too. This is a clear nod to potential Chinese customers but given their links to the Chinese Communist regime, we wouldn’t recommend using Alipay. There is no Bitcoin payment option anymore which, for the more privacy-conscious users, is a pity. Once you have signed up with StrongVPN, getting things going could, frankly, be a little more straightforward. On the account homepage, you will need to click on the VPN Accounts tab followed by Account Setup Instructions. This takes you to the page which links to the various StrongVPN apps. Confusingly, this page includes a section containing VPN login details, which are different from the account login details you were given when you signed up. But it is the sign-up login details you will need to get the app going, so we are not entirely sure what these ones are for. We would strongly recommend going back to their main homepage and downloading their apps from the VPN Apps tab at the top of the page. StrongVPN supports an impressively large selection of VPN protocols. As well as L2TP, SSTP, OpenVPN, and IPSec/IKEv2, they also offer the option of choosing between TCP and UDP and the useful Scramble OpenVPN patch which helps to mask VPN traffic. StrongVPN claims to have a no logging policy which extends to metadata as well as your internet activity. They are open about the fact that they do keep some customer details but insist this is only to set up accounts and communicate with customers. However, they have not yet gone so far as to get their no logs policy independently verified which some other VPN providers have done. StrongVPN currently offers a total of 650+ servers located in more than 20 countries around the world. This is not a huge selection with most premium providers offering significantly more. This is the same number of servers as StrongVPN had available last year and given the relatively low number, it is a shame that they haven’t invested in expanding their server network over the past twelve months. But StrongVPN does offer a decent geographic spread with servers in Europe, North America, South America, Asia, and Australasia available. For most users, this number of servers will be sufficient, but you should check that there are servers in the countries you need to use most before signing up. They may not have expanded their server network, but StrongVPN has improved the number of concurrent connections available with each individual account significantly in the past twelve months. In our 2018 review, we praised them for increased the number of concurrent connections to five. This year the number has leapt up to twelve. Being able to connect twelve devices with every account is a fantastic offer and the highest we have seen from any VPN provider. If you have a lot of devices you want to protect or plan to let your family or friends use your account, StrongVPN could be the best provider for you. StrongVPN is a fairly simple provider which doesn’t offer many of the bells and whistles of some of their rivals. For some users, this will be a disappointment, for others, such simplicity is a bonus. The one additional feature that is included with all StrongVPN subscriptions is their StrongDNS service. This is a neat a standalone SmartDNS service that lets you unblock content from around the world without the need for the VPN service and without encryption. It is really useful for unblocking content such as the BBC iPlayer or US Netflix without using a VPN. Using StrongDNS means your data isn’t encrypted which makes your connection faster but less secure. If you have slow internet speeds, it is a great way to enjoy blocked content without the irritation of buffering. One feature which is becoming increasingly essential but is lacking from some of their apps at the moment is a kill switch. This stops your data leaking if your VPN connection is cut. It is a vital privacy feature especially if you are using your VPN in sensitive locations like China. While it’s available on their Windows app it hasn’t yet made its way onto some of their other apps. A customer comment on their own website, says they hope StrongVPN adds this feature soon. We concur. 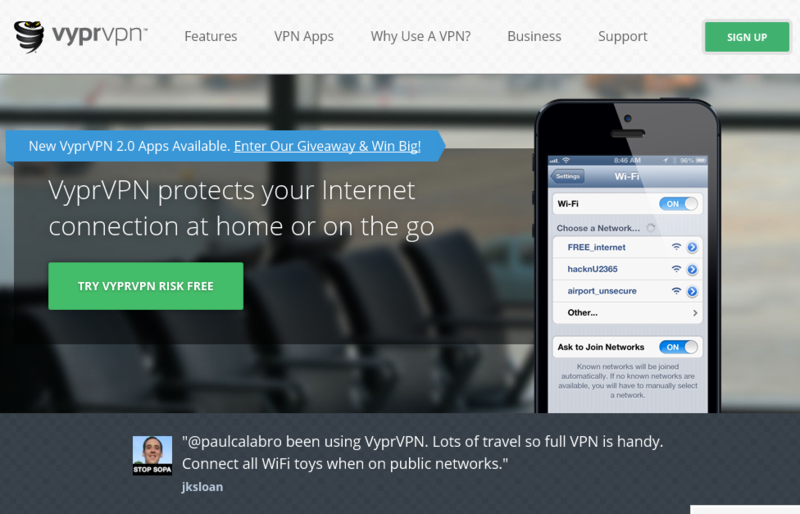 All of the StrongVPN apps use a similar design, look good and are very user-friendly. 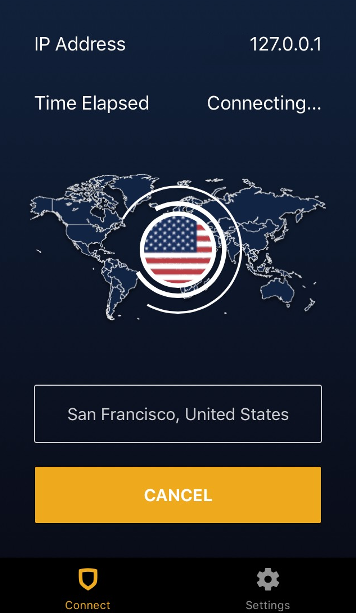 Their iOS app, which we tested on an iPhone but can also be used on iPad’s too, offers a simple one-click connect feature, a map showing which country you are connected to, and details of your IP Address and how long you have been connected for. Under the settings menu are options to choose a server from a different location and options to manage your account, as well as links to customer support. Their Android app follows a similar pattern too. It is all very simple and user-friendly, which is exactly what most users want from a mobile app. One slight disappointment is that the map is not interactive and so to change server, you have to manually search through the list. An interactive map would improve the user experience, especially on the mobile apps. The StrongVPN desktop apps are, if anything, even simpler. On their app, you can see your IP Address and connection time at the top. While underneath the world map showing where you are connected, there is a connect button and a button which allows you to choose which server you want to connect to. Clicking on this brings up a list of StrongVPN servers around the world which you can choose from. All other settings seem to have to be managed through your account page on the StrongVPN website which will be fine for some users but probably frustrating for others. Their Windows app does contain a settings option in the menu bar at the top which does allow access to some additional options. When you try to connect StrongVPN for the first time, it will tell you it needs to add VPN setup details to your computer. In our tests, this needed to be done every time you connect to a new server, which was extremely annoying and not something we have encountered with other VPN providers. StrongVPN offers quite a few additional apps on top of the standard four. On their website, you will find links to apps for Amazon, which can be used with Fire TV Sticks and Fire TV, Linux, Ubuntu Linux, Synology NAS, Kodi, Amazon Kindle, Chromium, and various different VPN routers. This means there aren’t too many devices which don’t have a dedicated StrongVPN ready to use. If you do encounter one, there are also lots of manual setup guides which, while a bit more complicated, should help you to get things set up. We tested StrongVPN on a regular household connection in the UK for a number of weeks. In general terms, their connection speeds were decent without being exceptional. Undertaking everyday online tasks such as browsing and checking emails was not a problem. However, when trying to stream video content from overseas using StrongVPN (rather than their StrongDNS feature), we did run into a few buffering problems which necessitated switching servers more than once. These speeds are not fantastic. But they are not the worst we have ever seen either. And with the inclusion of their StrongDNS feature as standard, it is still possible to stream content from all around the world without too many problems. As we noted above, StrongVPN has a great selection of VPN protocols available to choose from. They are a little bit coyer about what encryption many of these protocols use but we have managed to ascertain that their OpenVPN protocol uses AES-256 bit encryption with a 2048-bit RSA key for handshaking. This is on a par with most other VPN providers and while stronger encryption is available, this should be more than sufficient for most users to keep their online data secure. For EU-based customers, StrongVPN is GDPR compliant and, as we noted above, their no logs claims looks to be a legitimate one. StrongVPN has been around a long time, but it has come on in leaps and bounds over the past couple of years. Their server network still leaves a bit to be desired and their speeds could be improved upon too. But their privacy policies and encryption are sound and their user-friendly apps were very impressive. One of the biggest improvements over the past twelve months is the increase in concurrent connections to a market-leading twelve with every account. With prices that are competitive, as long as you don’t mind signing up for a year, this means that for many users, StrongVPN represents great value for money.